That quote may or may not have been me. At Proposition, we’ve been running some ad campaigns for clients on LinkedIn over the past few weeks, and we’ve been learning just how expensive ads are on the platform. They’re way more expensive than Facebook ads (sometimes 5-10 times). So we figured we’d make a video series exploring why. While I was researching the supply and demand issues exploring LinkedIn ads, something became pretty evident to me - it’s not just LinkedIn ads that are expensive in New Zealand. It’s all digital ad platforms. New Zealand is at USD0.54 per click on average, a whopping 46% above the USD0.35 global average. I can’t find Google’s stats for ad buy, but their AdSense payout rates give some idea of how attention is valued. New Zealand’s AdSense payouts are up there - although not quite at the highest rates. This may be due to lower levels of display ad choice for content creators in New Zealand, however. And LinkedIn? Well it’s just bloody expensive. No one cares about Twitter. We’ve pretty clearly established Aotearoa as an expensive place to buy digital advertising, but why? Remember Economics 101? I do. The simple world where there are two things that influence the price of things. Well, in the digital ad market, one of the biggest factors in the cost of digital advertising is the amount of ad space available - the supply. In the advertising game, we’re all bidding for eyeballs. The more eyeballs you can get on your ad, the more the ad is going to cost. In advertising, supply = eyeballs (or attention). Traditional advertising (TV, Print, Radio, and Out of Home (OOH)) has pretty defined supply. There are only so many hours in a day to play TV and Radio shows, and only so many spaces that we can tolerate advertising in print media and in the world around us. Once you know how many people see each of those advertising opportunities, you have a pretty good idea of the supply of attention, and can price accordingly. Digital is a bit different. The supply of digital advertising, especially on social media, is not just dependent on eyeballs and consumption time, but on the way people use the platforms. For instance: the quicker users scroll through Facebook, the more opportunity to show them ads. Supply goes up. Or: a user mainly uses LinkedIn to chat from their home screen. Supply goes down. So, why is ad supply lower in New Zealand compared to the rest of the world? It’s not a population thing - this has an impact on supply and demand. There’s no one source with a clear answer. We know that New Zealand has relatively high internet penetration (22nd in the world by % of population) and we know that Australians use screens for about 400 minutes a day (and this is a good enough proxy for Kiwis’ behaviour). Stats like these point to New Zealand being at the expensive end of the main pack - but don’t fully justify the higher costs. 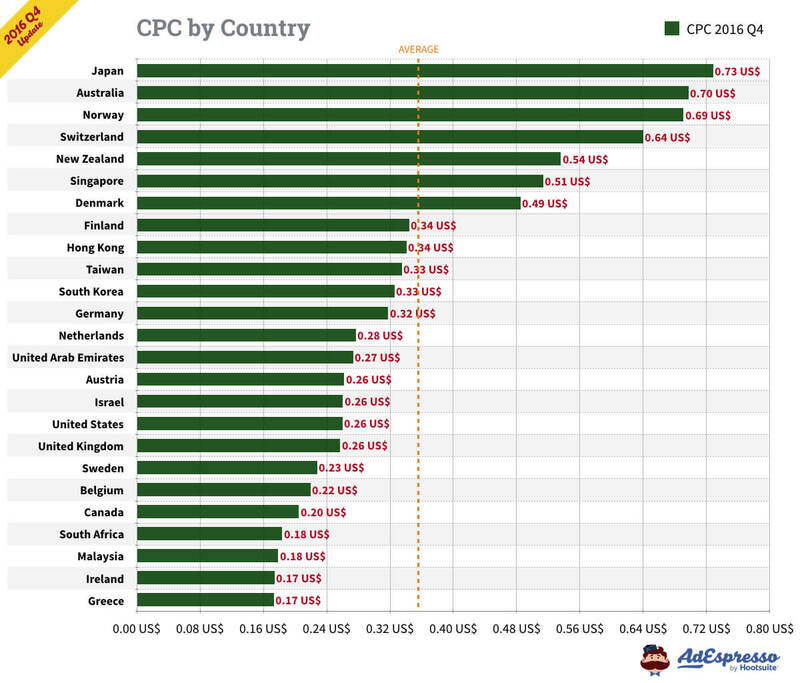 Australia’s average Cost Per Click on Facebook per the graph above is USD0.79, a full USD0.25 higher than the New Zealand numbers, with relatively similar stats. Without accurate statistics, it’s difficult to divine exactly why this is - maybe we should do a proper study into the Australasian ad market! However, if you’re looking for a reason why prices are more expensive in a particular market, always start with supply - it’s pretty obvious to me that the supply dynamics of the digital ad market in New Zealand are different to other places in the world. Why - well that’s another question. One of the best things about the digital ad market is the high level of efficiency that exists. This is because the market is controlled by computers and algorithms, not people and spreadsheets. Algorithms go way faster and deliver much more consistent results than people! The majority of digital advertising is sold on a “Real Time Bidding” basis, where an instantaneous auction for a single impression (view) occurs when the supply becomes available, and all the different buyers bid for the space. The winner’s ad gets displayed and their account gets charged the bid price. Many of the big digital advertising platforms, like Facebook, LinkedIn and Google use automated bidding to deliver really efficient distribution of ads. This means that instead of the ad buyer setting their own target bid price, the platforms’ algorithms define the best bid price and the optimal distribution for each piece of creative. Automated bidding enables the platforms to operate a hyper-efficient market and maximise their revenue. For example - Facebook get exactly what they believe their revenue to be worth, while an ad on the front page of the newspaper costs the same - whether 100,000 or 150,000 people look at the paper that day. Platforms that are set up to maximise revenue are always going to cost that little bit more - and the digital ad platforms we use in New Zealand are definitely revenue maximising. Finally, the old counterpoint to supply - demand. In a market with limited supply, the smallest changes in demand can lead to reasonably big price differences. We already know there are limits on supply of digital advertising in New Zealand relative to the rest of the world, but what about demand? Mobile advertising spend, per the Interactive Advertising Bureau, grew by 50% year on year through Q1 2018. This is the highest growth area of digital spend - unsurprisingly, it’s also the highest growth area of digital consumption. This growth rate is higher than the adoption rate of devices, which suggests that more and more New Zealand businesses are starting to demand digital advertising space. Interestingly, it’s lower than the growth rate of data consumption (104% growth from 2016-2017) but this more likely represents the increase in video and audio streaming, not any significant change in usage time. Most of this space doesn’t receive advertising (yet). Digital advertising adoption is strong with larger businesses in New Zealand, but anecdotally it’s still pretty hit and miss with smaller businesses. As the Kiwi SME market begins to demand more and more digital advertising space, this will only drive costs higher in New Zealand. Through breaking down why digital advertising in New Zealand is relatively more expensive, we’ve also taken a look at what by now is quite a mature digital advertising market. We’ve definitely come a long way since the early days of Facebook ads at the start of this decade. Over the last year or so, we’ve seen the free to air TV and radio providers make big pushes into online through On Demand services. They’re running ads on these services, but as far as digital goes, they’re pretty untargeted. The next logical step is to see the targeting capabilities of Facebook and Google ads built into in-stream content advertising. This presents a really interesting opportunity for smaller businesses who’ve never previously been able to use these platforms. I think we’ll also see these targeted digital ad opportunities creep into sports streaming (along with an Augmented Reality style advertising offer, but that’s a whole other blog post) and Netflix style products. These are all pretty new technologies though, and you’ll still have to play where the attention is. If you’re not already advertising digitally, ask yourself why - and what your plan is to get started. It might be expensive, but it’ll only get harder the longer you wait.